Double-signed and numbered US first limited edition. 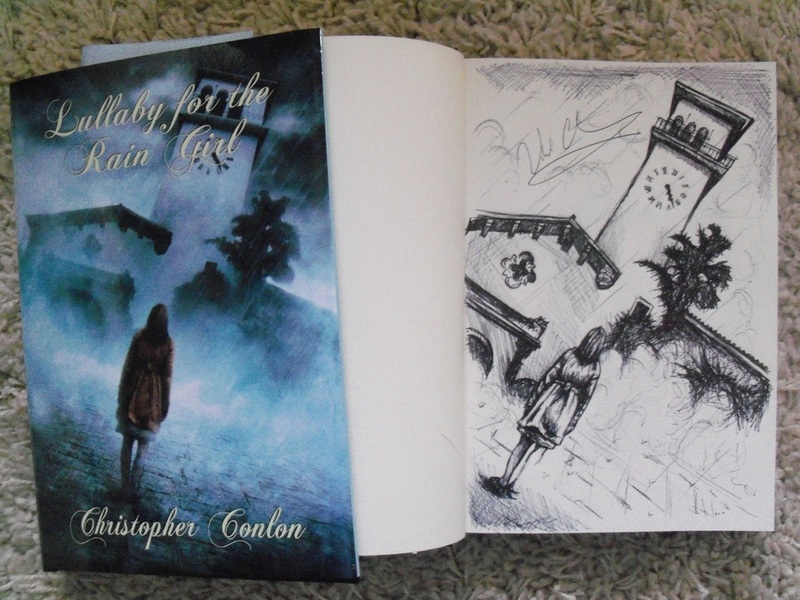 Signed by the author Christopher Conlon - signed and remarqued by the cover artist Vincent Chong. Synopsis : At age 36, Ben Fall is a man in torment. Overstressed, out of shape, in the middle of a bitter divorce, and carrying a secret that weighs heavily on his psyche, he's convinced he's a failure. He can hardly get out of bed in the morning to make his way to the high school where he teaches English. But suddenly one gray afternoon, a mousy, nondescript new girl appears in his classroom. She seems fascinated by everything he says and does--disturbingly so. Yet, though she gazes obsessively at him and hangs on his every word, she won't even tell him her name...just that she's "The Rain Girl." Who is she? Where does she come from? What does she want? The answers Ben finds will prove heartbreaking...and horrifying. "We could call this book a 'contemporary metaphysical mystery' or a 'modern fantasy,' but it's far more...Lullaby for the Rain Girl resonates like the Expat Paris of Hemingway in A Moveable Feast and the 1960s College Crazy of Richard Farina's Been Down So Long Looks Like Up To Me: detailed recall of 'what was' interwoven with 'what should have been.' There's a rough 20th century romanticism, too, something like Richard Matheson's sensibility filtered through Henry Miller's libidinous viewpoint. It gives us the hauntings of not-quite-ghosts, lingering regrets and remembrances, and the documentation of the results of not so wise but always human choices. It is one hell of a story told by one hell of a writer, a novel that feels more evocatively true than many memoirs." "This powerful novel is both innovative and a fine example of world-class storytelling: it's about life and the restless shadows it casts; it's about death and ghosts who aren't ghosts. Gripping, nuanced, and deep, Conlon's novel delivers." - John Shirley, author of Bleak History and In Extremis.